[T]here were good reasons why a printed book should not be impersonal. Careful printers who tried to correct a faulty manuscript copy might be confounded with careless printers who gave little heed to editing or proof-reading. There were also piratical printers who stole the editorial work of more painstaking rivals, and sold faulty reprints as the work of their honest rivals, but always at lower price. After some unpleasant experiences consequent on unwary purchases from unknown printers, the critical reader began to discover the relative merit of books. Before he bought a new book he looked for the imprint of a reputable printer as some guaranty of its accuracy. A book without attest was like a bit of silverware without the official stamp; it might be good, it might be bad, but the latter conclusion was oftener reached. 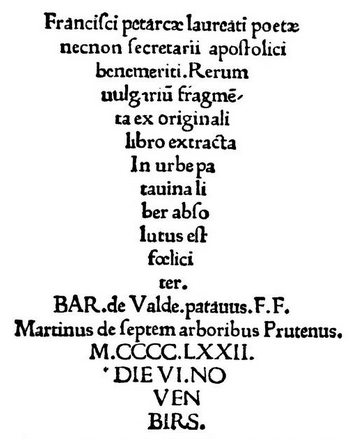 When the fifteenth century closed, the printers of good standing in all countries put their names at the end of their books. 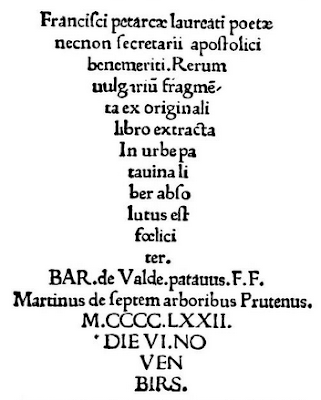 Petrarch by Bartholomew Valdezocchio, made at Padua in 1472.